By Gavin Hyland | November 27, 2016. On January 15th 2009 United Airlines flight 1549 performed a forced water landing on the Hudson river in New York with 155 people on board. ‘Sully’ is the dramatic movie adaptation of that fateful day. Captain Chelsey ‘Sully’ Sullenberger and first officer Jeffrey B. Skiles took off from La Guardia airport when the aircraft was struck by a flock of birds leading to dual engine loss and an emergency landing but that is not the end of the story. When being questioned by investigators, first officer Skiles (Eckhart) says, “Everything is unpresented until it happens for the first time”. The movie shows the public and media declaring the crew heroes and labelling the event ‘Miracle on the Hudson’ but views begin to change when NTSB (National Transport Safety Board) investigation finds the plane could have returned safely to La Guardia airport. Captain Sullenberger begins to doubt his every decision saying “I’ve delivered one million passengers in the air and in the end, I’ll be judged on 209 seconds”. Captain Sully’s doubts only increase as evidence begins to pile up against him. The movie can, at times, be repetitive and too many flashbacks and dream sequences take away from Hanks’ performance. 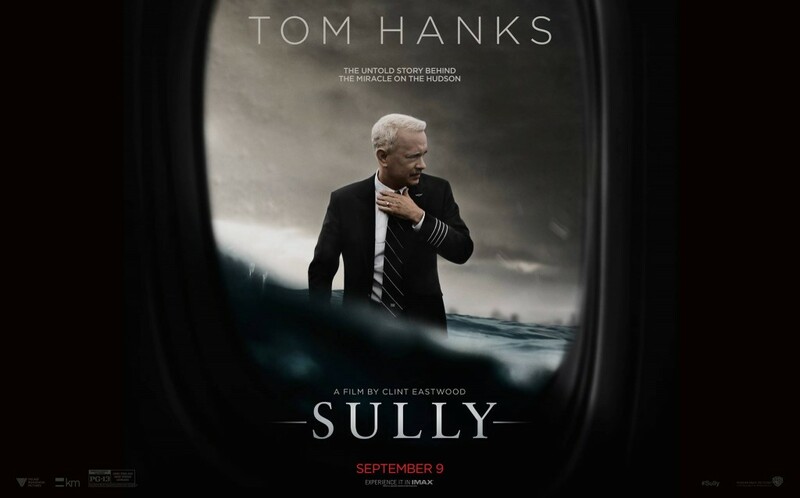 ‘Sully’ shows the event from the point of view of the Captain himself, the rescue teams, tourists and locals and the air traffic control tower who believe the plane has crashed with no survivors. CGI and special effects bring the terrifying ordeal to life for those of us who were not present on United Airlines 1549. The chemistry between Hanks and Eckhart (1st officer Skiles) is important and enjoyable to watch. Hanks does an excellent job in portraying Captain Sully as a private family man who is struggling with his newfound fame. He looks awkward when on chat shows and in interviews but is loving and endearing when speaking with his family. Eastwood uses a non-linear format to tell the story and dream sequences are often used to show the self-doubt of Sully. Flashbacks tell the history of the 42-year career which hangs in the balance of the NTSB investigation.